Interested in switching to flexible seating? Get funding ideas, helpful tips, and how-to photos from the pros—your fellow high school teachers. Sleeper wasn't the only one feeling anxious. 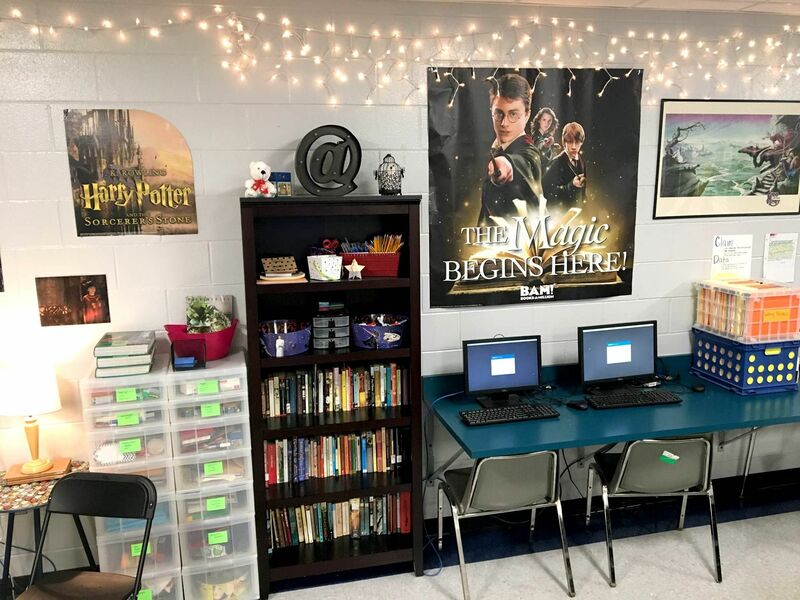 The sheer size of high school students is a concern for teachers who are exploring the leap to flexible seating in grades nine through twelve. Without the efficiency of rows of desks, how do you squeeze a lot of big kids into learning spaces that are often no larger than 700 square feet? And the questions didn’t stop there when we asked high school educators for their thoughts on flexible seating. They also wanted to know if flexible seating would make things too casual, producing a climate of distraction—or even outright chaos. 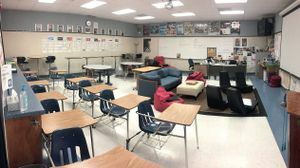 A few educators worried that there might be more students sleeping in class, or using the new space to socialize with friends instead of learning. 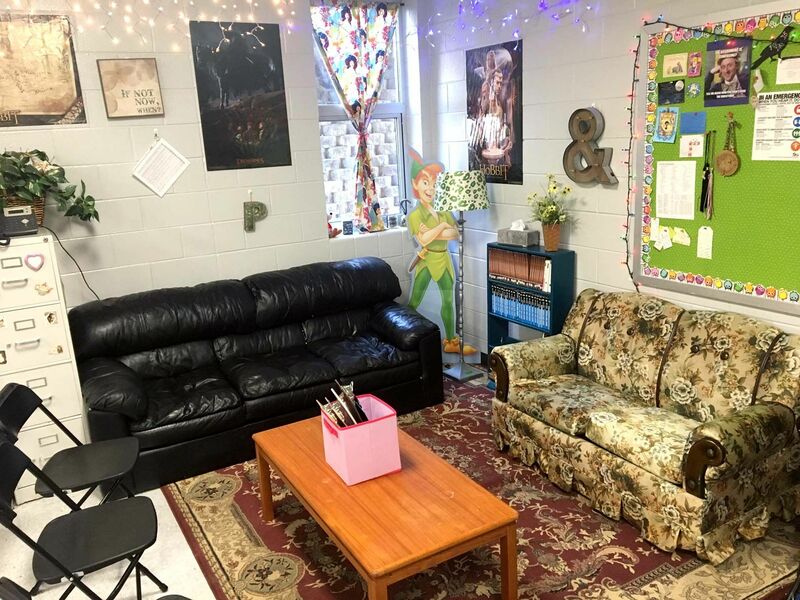 Other teachers, already spending too much of their own money on classroom upgrades, expressed doubt about finding the money to fund purchases of new furniture. The good news? In our recent email interviews with 20 teachers who have converted to flexible seating—five of whom were high school teachers—we found positive responses to most of the common issues. 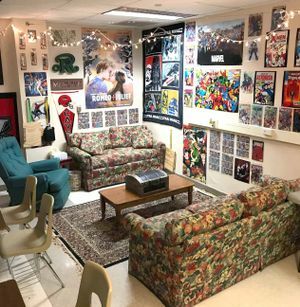 High school teachers were making flexible seating work in rooms that averaged about 750 square feet. The number of students per class ranged from 27 to 34. Respondents were almost universal in reporting that their students took their seating options seriously and that discipline problems had actually decreased since the shift to flexible seating. There were some challenges. Furniture breaks more easily with bigger bodies, a few teachers noted. Funding often came up short of ambitions, leaving teachers to source tables, couches, and chairs from friends and family, thrift stores and garage sales, PTA grants, and crowdfunding campaigns on sites like DonorsChoose. Standardized testing forced some of the teachers to bring desks back into the room at intervals. 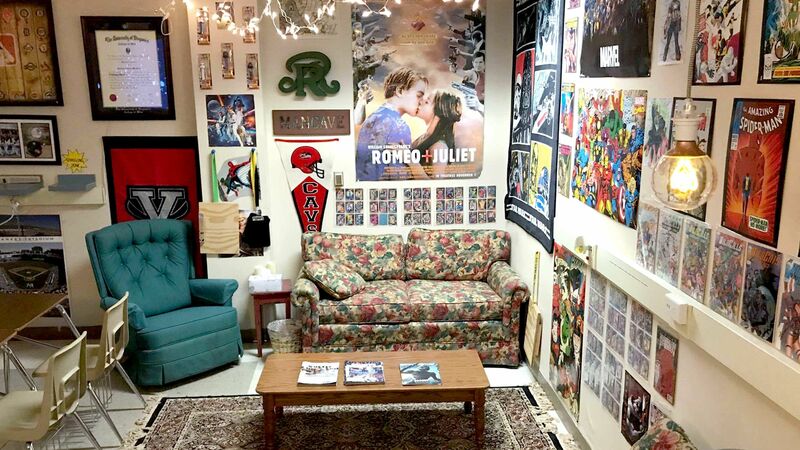 Here’s a look into the classrooms of four high school teachers who we reached out to. 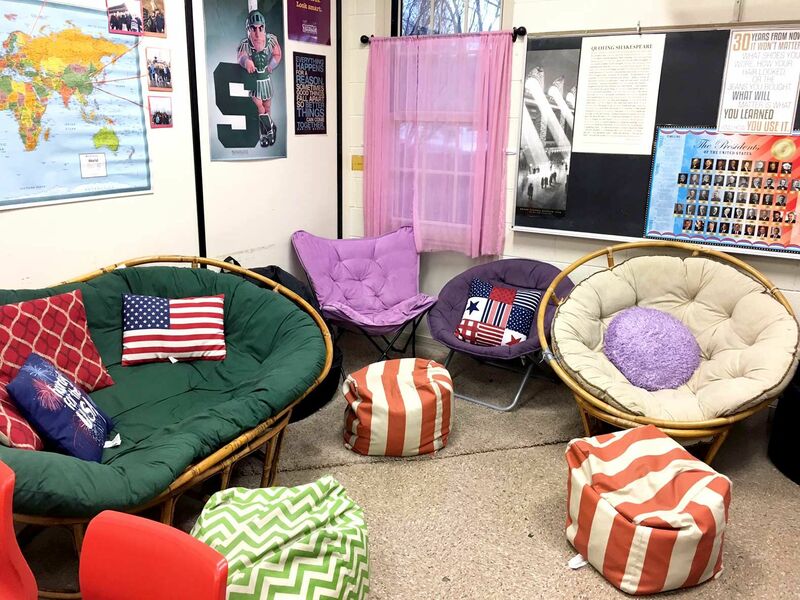 Setting It Up: My goal for this project was to make students feel at home in my classroom. I had a very small budget, so I relied heavily on donations and bargain hunting at thrift stores. The PTSA at our school provided me with a grant of $200, which allowed me to purchase a couch, a love seat, a rug, two small tables, and about eight folding chairs. A friend donated a coffee table, while a parent donated a second area rug. I added my own soft lighting, additional bookshelves, and Harry Potter decorations to make the room feel additionally cozy. Some of my students actually prefer to sit in desks, which surprised me, while others tuck themselves away in the Harry Potter reading nook. Benefits: Discipline issues have significantly decreased. My students seem to feel more relaxed and more motivated in a setting that honors their choices. I have not had to assign seats for the majority of the semester because my students know that if they cannot get their work done on the “fun seats,” they will be moved to a desk. I make sure to explain to them that this isn’t a punishment; I am here to help them be successful, and sometimes that means making hard choices. 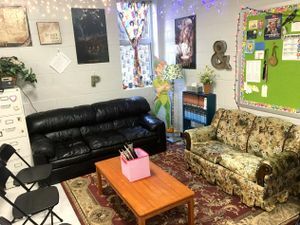 With a $200 grant from the PTSA—and furniture donated by a friend—Emily Polak added a couch, a love seat, a coffee table, two rugs, and eight folding chairs to her classroom. 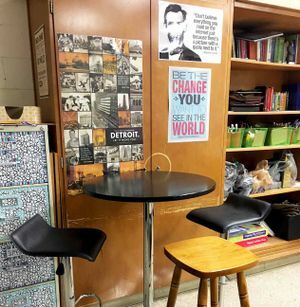 In addition to comfortable furniture, Polak kept some traditional seating, an arrangement that’s typical of many of the high school classrooms we saw. Polak created a tech station next to the reading nook, and uses a range of storage options. 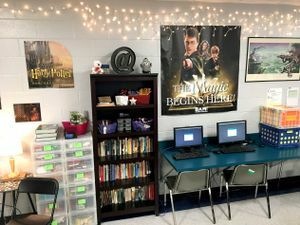 She hangs Harry Potter posters throughout the classroom to share her personality with her students. Setting It Up: I used hanging lights, Christmas lights, and Edison lights to give the room an atmosphere of relaxation. 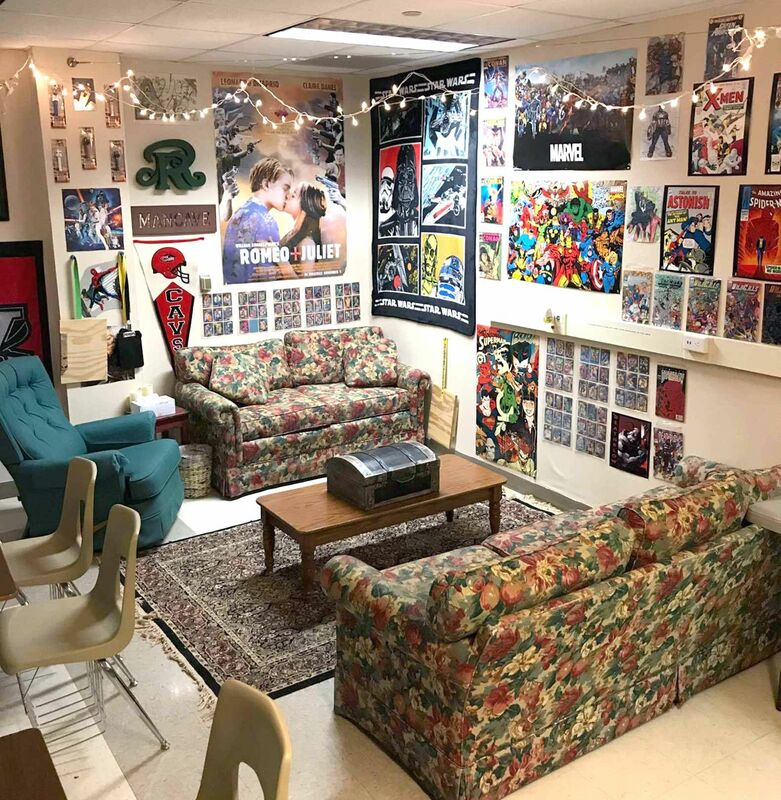 I added a recliner, love seat, and sofa—and even a disco ball to the ceiling and black lights around the Smart Board for special days and assignments. I installed a charging station for phones and brought in a mini-fridge and microwave. Students have a stake in the comfort because they donate coffee and tea for the Keurig. Each grouping of desks has its own supply tub for the week: scissors, glue sticks, note cards, and sticky paper. There’s even an official class pet called Bruce the Beta Fish. I let the students see my personality a bit through the inclusion of family pictures and a wall of college and sports memorabilia. Benefits: The students have responded with better attendance and written work, improved grades, and a more positive culture in the room. If students are worried about their phones, their stomachs, or being tired, they can’t pay attention and focus in class. Now I have removed those issues from the equation. To create an atmosphere of relaxation, Josh McDaniel added a recliner, a love seat, a sofa, a throw rug, a coffee table, and hanging lights in one corner of the room. 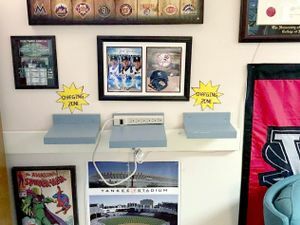 McDaniel set up a charging station for his students’ cell phones. 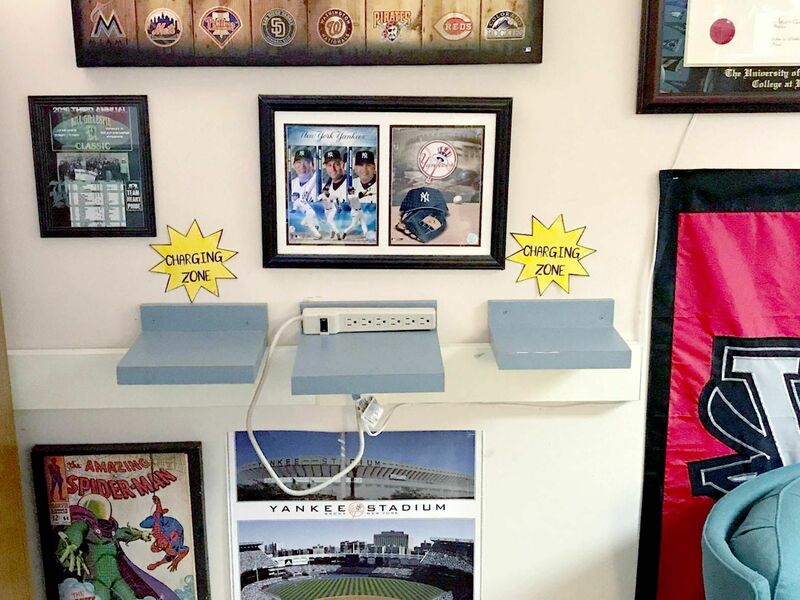 A big sports fan, he infuses the room with his personality through sports memorabilia on the walls. McDaniel groups desks into pods, surrounding them with flexible seating zones to support different learning modalities. 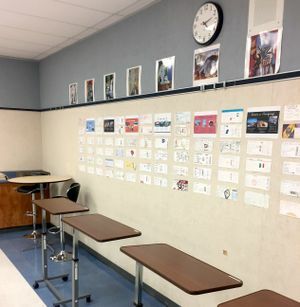 Setting It Up: A major hurdle was making sure the school could still use my room for state testing, so twice a year the students help me move the desks back into the room. We pile all the furniture up in the front of the room to make space. I funded some furniture purchases through a DonorsChoose campaign, and I did a fair amount of garage sale shopping over the summer. Some was old furniture I owned, and a few pieces were donated from families in the classroom. I don’t implement a seating chart. 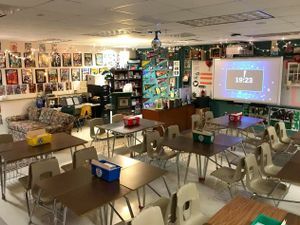 During the first week, I make students choose a new seat each day so they get a chance to try out different spots—and they are aware that I reserve the right to move them at any point. Benefits: Most of the examples I’ve seen were for little kids with little bodies, so it wasn’t easy to make the adjustments for high schoolers. Students tell me they can focus better in my room because they aren’t uncomfortable, and I have not had any issues of kids falling asleep. I think there are probably fewer kids falling asleep this year than in previous years, when I just had desks. 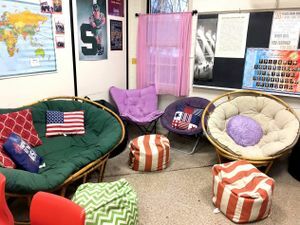 With a 750-square-foot room, Kendra Caralis arranged a variety of seating in one corner—from beanbags to collapsible chairs—to accommodate her 32 students. 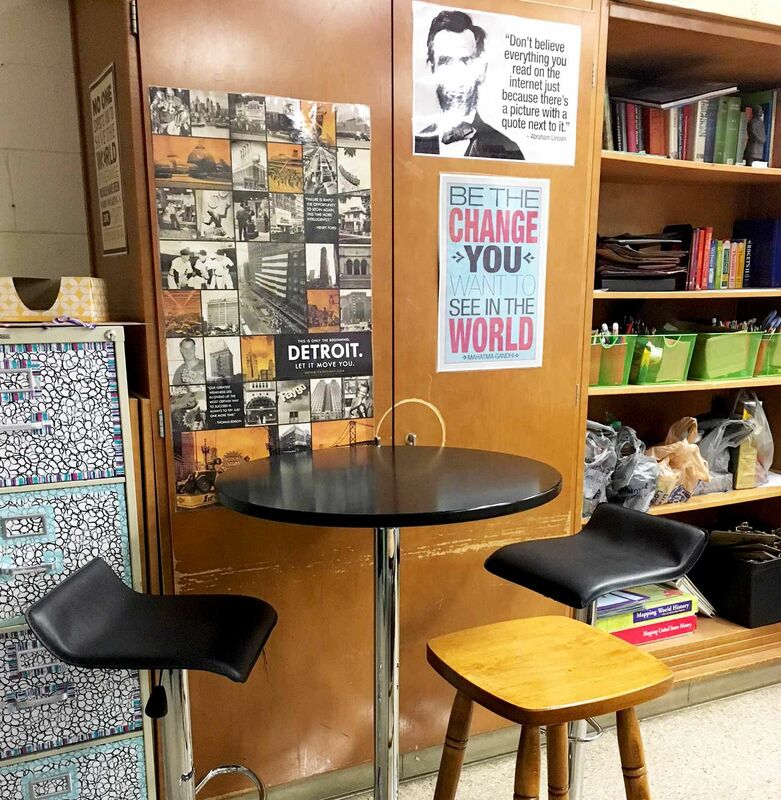 Caralis got most of her furniture—like the stools and bar table here—through a DonorsChoose campaign and garage sales. Having different table heights for standing and sitting is a common feature in flexible classrooms. 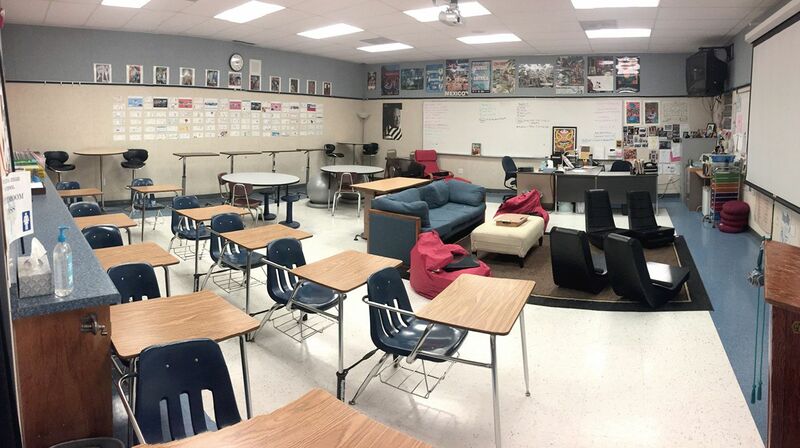 During state testing, Caralis’s students pile all the furniture at the front of the class and move desks back into the room. Setting It Up: I changed seating formats during the year. For the first four months of the 2016–17 school year, my 153 Spanish 3 and Spanish 4 students had a traditional seating classroom. They all sat in student desks facing forward or moved the desks into group configurations. 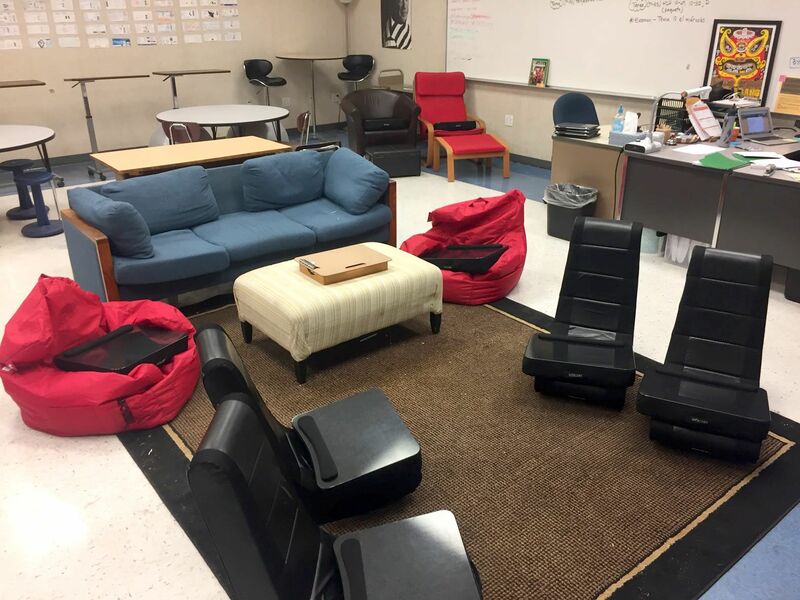 After that the same students had a flexible seating classroom with a layout that included a wide variety of furniture types. We have four standing desks, two cocktail tables with stools, two armchairs with ottomans, a sofa, four gaming chairs, and two beanbag chairs. For the first two weeks of the new seating, students had to try a different seat every day to experience each of the 10 “zones.” After that students could choose where they wanted to sit on a first-come, first-served basis. Benefits: I conducted a survey (there were 143 participants) to test the results of the new flexible seating model. Here’s the basic summary: Students transitioned to the new seating style easily, strongly favored the change, and made their daily seating selection with a desire for success in mind. Students were less sure that they were “retaining information better” than that they “were not distracted,” but the overall results were very encouraging. Nichole Murray switched from traditional desk seating to flexible seating in the middle of last year. She now mixes traditional desks with beanbags, a sofa, gaming chairs, armchairs, and stools. Murray included simple standing desks, catering to her students’ different learning preferences. 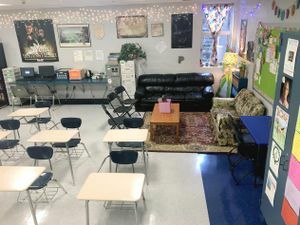 A view of Murray’s full classroom, which represents a first-year transition from traditional to flexible seating. This article would not have been possible without the contributions and/or photography of the following educators: Kendra Caralis, Josh McDaniel, Nichole Murray, Emily Polak, and Mylène St-Cyr. Their classrooms are amazing, and we’re grateful they shared them with us.